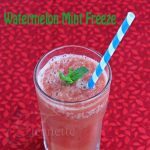 Watermelon Lime Slushie is a healthy, refreshing summer treat that will bring back childhood memories. Have you ever had a slushie? They’re usually neon colored and super sweet. I’ve come up with a healthy alternative to this cold summer drink. 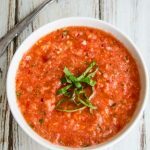 This watermelon lime slushie is made with just three ingredients and is so much healthier than the ones I had as a kid – no artificial colors or flavors, just whole ingredients. Sponsored by MegaFood. I’ve been juggling a lot of balls in the air lately and feeling pretty stressed out and overwhelmed with everything on my plate. Stress is a normal part of life, but being in a constant state of stress can wear anyone down. Reducing stress is the one area that I struggle with the most in trying to live a healthy, well-balanced life. Like most people, I like to be in control of my life, so when things start feeling out of control, my stress level rises. Since the beginning of this year, my husband and I stepped in to help take care of my 90-year aunt, who never married or had children, and was living alone. I believe one of the greatest gifts I can give someone is my time as a way to let them know they are loved. That is what I am trying to do for my aunt. Needless to say, this huge new responsibility has consumed a lot of my mental, emotional and physical capacity, and added a lot of stress to my life, but I don’t regret this decision for one minute. However, I do need to learn how to manage my stress better. How have I been trying to manage my off-the-charts stress level? Letting go. As much as I want to control everything in my life, I can’t. So, I am trying really hard to trust that God will take care of things I can’t. Enjoying nature. I love taking long walks outside during the warmer months, so I have been making it a point to get outside and get moving even when I don’t feel like it or don’t think I have the time. Prioritizing and saying no. There are just so many hours in the day, so I try to focus on a few key items each day that absolutely need to get done. I’ve also gotten better at saying “no” to take things off my overloaded plate. Watching what I eat. 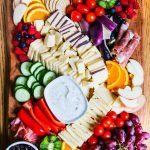 In the past when I’ve been stressed out, I haven’t paid as close attention to what I eat. 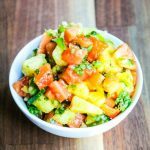 This time around, I’ve actually been much better at making good food choices. 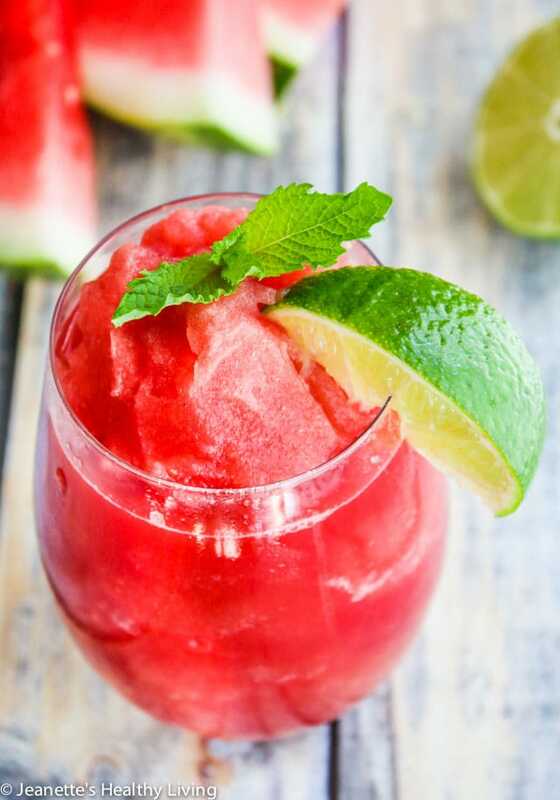 Take this Watermelon Lime Slushie for example. 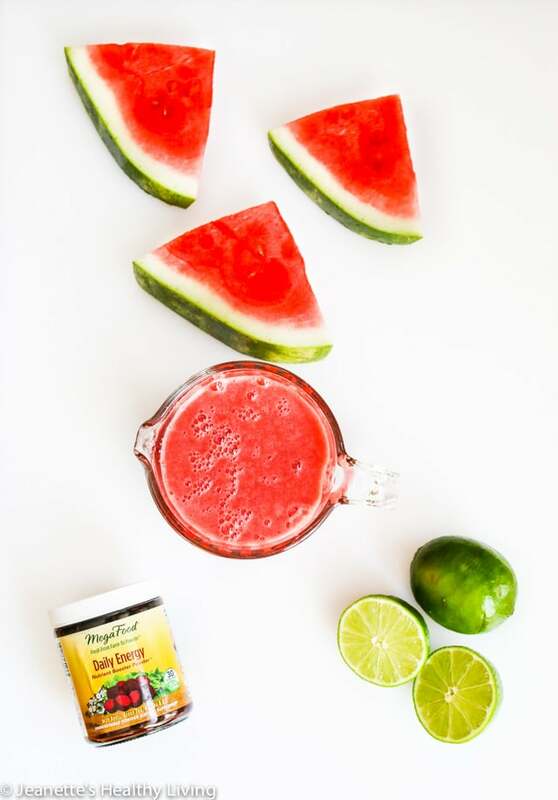 It’s made with just watermelon, lime juice and gets an extra nutrient boost from MegaFood’s Daily Energy Nutrient Booster Powder™. I chose Daily Energy out of MegaFood’s line of booster powders because it contains Eleuthero, Ashwagandha, and Bacopa, herbs that support your body’s ability to perform and manage through times of stress. 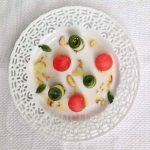 * In addition, it contains chromium and green tea which help with mental alertness, focus and a healthy metabolism*, which often go hand in hand with stress. 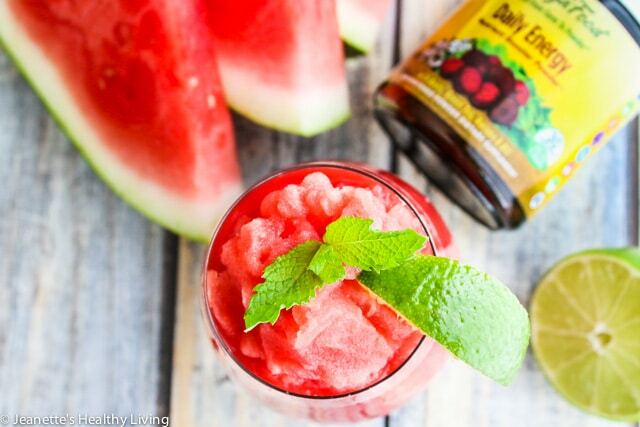 Now, let’s make our Watermelon Lime Slushie. 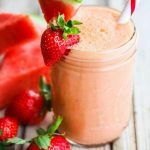 This recipe has just three ingredients: watermelon juice, lime juice and MegaFood Daily Energy Nutrient Booster Powder To make watermelon juice, simply put watermelon chunks in a blender and blend until smooth. Then, strain any pulp out. This will make an amazingly smooth slushie that melts in your mouth. 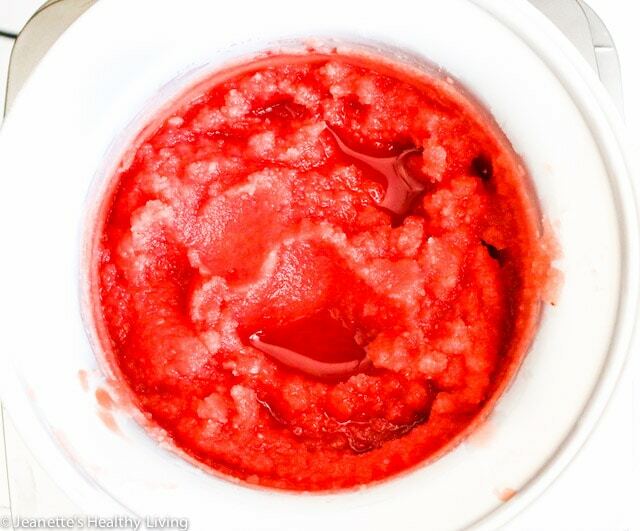 I used my ice cream maker to get the perfect slushie consistency in just 20 minutes. This cold, refreshing slushie was a hit with my family on a recent hot 90-degree summer day. Drinking one of these was definitely stress-busting! 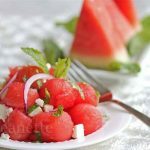 Put watermelon chunks in blender and blend until smooth. Strain watermelon juice. 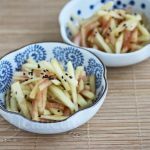 You may have to do this in a few batches. 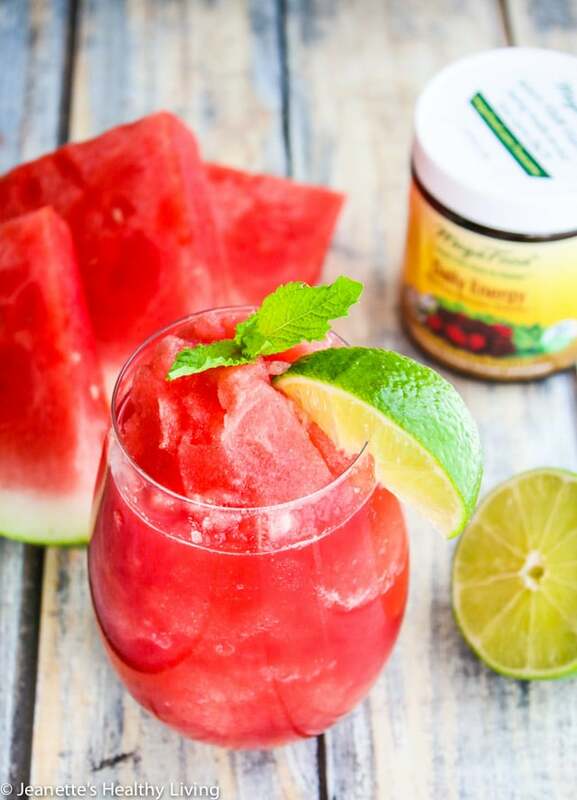 Put watermelon juice, lime juice and Daily Energy Booster Powder in blender and blend just until combined. Pour into ice cream maker (follow manufacturer's instructions on how to prepare your ice cream maker for use) and let ice cream maker run for about 20 minutes until mixture reaches slushie consistency. 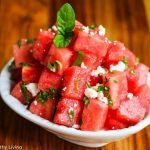 Very pretty, healthy and perfect summer cooler! Thanks Angie – this is so refreshing. Hope you’re having a wonderful summer! 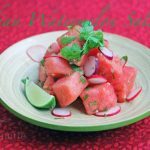 Hi Melissa – this is really refreshing – you could make this with other melon too. I hope you enjoy this! It is very refreshing! Thanks Sayino – you could substitute a different melon that you like.